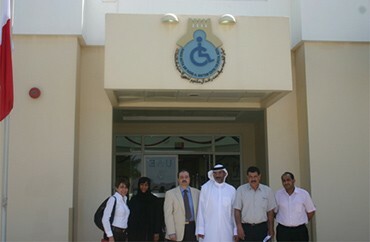 Based on the directions of Professor Najib Al Khaja, Secretary General of Sheikh Hamdan Bin Rashid Al Maktoum Award for Medical Sciences, and as a good initiative for cooperation between the Award and Al Maktoum Foundation, a delegation representing both institutions visited Sheikha Maitha bint Rashid Al Maktoum Center for Special Needs in Hatta. Prof. Najib Al Khaja said that the Award and Al Maktoum Foundation are working together through an integrated system supported by H.H. Sheikh Hamdan Bin Rashid Al Maktoum, Deputy Ruler of Dubai and UAE Minister of Finance, who gives special attention towards helping all sectors of the society. He added that the visit aimed at discussing ways of vital cooperation between the Award and the Center, which will be translated into reality in the near future through accurate medical diagnosis of the affected children and by holding training courses and public lectures directed to the population in Hatta and its neighborhoods to raise awareness on the serious impact of genetic disorders and the importance of premarital testing and newborn screening to reduce the spread of these disorders already causing negative impacts on individuals and the society. Mohammed Obaid Bin Ghannam, Secretary General of Al Maktoum Foundation, praised the visit and said that he welcomes all forms of cooperation between the Foundation and the Award aiming at helping disabled people in the United Arab of Emirates, who need all forms of support to mitigate them and their families. He added that it is possible to take advantage of the extensive experience of the Award in the field of genetic disorders through the efforts of its "Centre for Arab Genomic Studies" (CAGS). The delegation included Abdullah bin Souqat ,Executive Director of Sheikh Hamdan Bin Rashid Al Maktoum Award for Medical Sciences, Dr. Ghazi Tadmouri, Assistant Director CAGS, Dr. Lihadh Al-Gazali, Professor of Clinical Genetics in the Pediatrics Department at the Faculty of Medicine, UAE University, and Member of the Executive Committee of CAGS, Ms. Moza Hareb, Human Resources Executive at Al Maktoum Foundation. The delegation met Hichem Damergi, Acting Administrative for the Center. Sheikha Maitha Bint Rashid Al Maktoum Center for Special Needs is considered the only center serving Hatta and its neighborhoods to serve children with special needs. The center is a large two-stories building especially designed to host children with special needs. The Center serves about 53 children with special needs and from various nationalities. Admission requires an official certificate proving the status of the child. The Center offers care, education, and treatment for various types of disabilities including deafness, quadriplegia, Down syndrome, mild and severe mental retardation. Mr. Abdullah Bin Souqat said that Sheikh Hamdan Bin Rashid Al Maktoum has a human feeling that puts vulnerable groups in the society at the top of his priorities. He added that this trend is the reason behind establishing the Award?s Centre for Arab Genomic Studies in 2003, to put a limit to spreading genetic disorders in the Arab World that compromise health and stability of Arab families. He added that the visit will help children in the Center to be put on the right path, whether in terms of treatment or in terms of social rehabilitation in order to be enrolled in the society. He said that the society should change the perception of children with special needs and encourage their families to engage them in the society openly. He added that a special program is being prepared to contact the families of the children to persuade them on the importance of premarital testing and newborn screening to assure early detection of these diseases and to reduce their consequences in the future. Prof. Lihadh Al-Gazali examined the children during the visit and said that the proper diagnosis of the disorders found among them is the first step for proper treatment. Dr. Ghazi Tadmouri, Assistant Director of CAGS, said that CAGS has paid particular attention, since its establishment, to convey genetic information to all members of the society and to raise their awareness about genetic disorders through seminars, conferences, and publications. Hichem Damergi, Acting Administrative of Sheikha Maitha Bint Rashid Al Maktoum Center for Special Needs, appreciated the visits and considered it as a productive step that meets well with the educational goals of the Center.